I approach this whiskey with some trepidation as my limited experience so far with smoky American whiskey has not been a positive one. 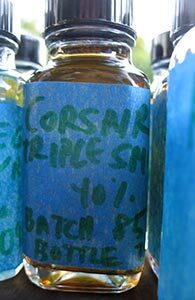 Nor is it a good sign that the distillery puts the word “artisan” in its name: Corsair Artisan Distillery. In the food and drink world in the US the intersection between those who bill themselves as artisans or artisanal and those who talk a better game than they play is large enough to accommodate Jim Murray’s opinion of himself. It’s true that earlier this year this was named the “Artisan Whiskey of the Year” for 2012 by Whisky Advocate, but given that the competition likely included the Balcones Brimstone that may be akin to being named “Most Reasonable Person” at a Tea Party convention. Anyway, let see what this is actually like. It’s called “Triple Smoke” because it comprises whisky from malt smoked with peat, malt smoked with beech wood, and malt smoked with cherry wood. Nose: Yow. Sour wood and leather armchair on which someone’s spilled Cherry Coke. Then a sweet gingeriness arrives (powdered ginger) along with a lot of something that smells like wood floors that have been cleaned with a solution designed for getting rid of pet stains. I’m not making it sound appealing but it’s actually not bad. The whole smells very much like one of those childhood tonics I mention every once in a while. The peat’s not very apparent but smoked wood, yes. There’s a richer sweetness after a while and it all begins to smell very much like an old polished wooden box that once held dried flowers. I like where the nose goes but somehow this has me a little nervous about taking a sip. Later, however, it goes back to just being very powdered gingery-sweet. Palate: Hmmm. There’s almost nothing on the palate but the wood. It’s not overbearing or nasty wood but that’s all there seems to be. It’s not particularly smoky in any way, let alone three ways, and it’s rather watery and thin. With time the ginger shows up here too and there’s a little more spice and a little more sweetness. Finish: Medium. The wood gets a little spicier and a little sweeter. Later it gets just a little bit astringent. Comments: I’m not sure how much batch variation there is or at what stage in the bottle’s life this was poured but while the nose is expressive this starts out rather blank on the palate. Later some woody sweetness develops but it never quite makes it to being interesting. It’s drinkable, I guess, and there’s nothing here I dislike per se but there’s also nothing here that makes me want to drink it again; the Brimstone at least has character. 2012 must have been a terrible year for “Artisan Whiskey”. Rating: 75 points (pulled up by the nose). Thanks to Bryan F. for the sample.